Raja Ampat homestays are not homestays in the usual sense. You won’t be sharing a family’s home if you stay at one. You will however, be the guests of a Papuan family, staying on family-owned land in what was once the only type of housing built in the islands. We’re going to continue using the term “homestay”, because that’s how this type of accommodation is referred to by both their owners and Indonesian tourism promotion agencies. Raja Ampat homestays are the cheapest accommodation available in the islands. On the majority of islands they are the only accommodation available. Raja Ampat homestays are not, however, as cheap as similar accommodation elsewhere in Indonesia or SE Asia. Why? Read this article. Homestays also do not provide hotel style amenities and services. Homestay room construction and amenities are in most cases very basic. Bedding at most homestays is a mattress on the floor. Electricity at most homestays is only available at night. Homestays do not offer the level of amenities and service you might expect when comparing prices with other destinations. All homestay prices include 3 meals a day and unlimited drinking water, tea and coffee. Most families operating homestays have no experience of the hospitality industry. The majority have no experience in business of any kind. Adjust service expectations accordingly. If you regard any of the above as essential, then homestay accommodation is definitely not for you. Read on for a more detailed description of what to expect, or skip straight to the accommodation page to check out individual homestay amenities. The photo gallery on each homestay page shows what’s available. A completely traditional homestay, whether it’s a stilt house over the ocean or a bungalow on dry land, will be bush wood or sawn timber framed, floored with sawn planks and have palm thatched walls and roof with no ceiling. Construction styles of the typical traditional homestay range from a single room with one window, to large four-roomed multi-windowed bungalows with verandahs and perhaps a common room. Windows are usually openings with thatched panels hinged at the top and held open with a stick. Doors are either sliding or hinged thatched panels. (You cannot lock your room at most homestays.) Floors are almost always sawn or split timber, but there are a couple of places with sand floors, and – at the other end of the spectrum – a few that sit on concrete pads and have tiled floors. Fully traditional homestays have bedrooms and living areas only – you won’t find a kitchen, bathroom, toilet or laundry in a traditional Papuan house. As the sector develops, many homestays have begun to upgrade their bungalows to include features like ensuite bathrooms, real beds, bathrooms with showers, glazed windows, lockable doors and so on. Even in the best available rooms, construction materials and style means you’ll be sharing your room with some of the local wildlife. Insects and small lizards inhabit the thatching, termites will be quietly moving in somewhere and the buildings’ many small gaps and cracks allow easy access for all kinds of tiny critters. It’s best to keep food in sealed containers to avoid attracting native rats and any other opportunistic scavengers that may live nearby. Detailed information and photos of each homestay’s bungalows and rooms are provided on individual homestay pages. Take care if using portable stoves or other naked flames indoors, and be extra careful if you leave mosquito coils burning unattended – palm thatch huts are obviously eminently combustible! NOTE: If you want a bungalow with the best amenities available, use the “Has ensuite bathroom/toilet” search filter on the accommodation page. For the very best on offer, enter “VVIP bungalow” in the Keyword search field. Chairs & tables: With the exception of bedding and a (usually separate) dining area with bench seating, many new homestays have very little furniture except for a couple of chairs or bench seats and a small table. This varies from place to place. Bungalow verandah furniture is always provided in established homestays. Some homestays have plenty of chairs and perhaps hammocks. Many provide beachside table settings with seating and dining shelters with a large tables and benches. Some have decks over the water with hammocks and table settings. One even has a lounge room with armchairs and occasional tables! Each homestay page and photo gallery shows what was available at our last visit. Storage: There might be some simple shelving in your room, or there might not. Don’t expect to find cupboards or wardrobes. (Although there are a couple of places that have them.) If you want to guarantee being able to hang stuff inside, then it’s wise to bring a line with you. There’s also no secure storage for valuables at any of the homestays we know of, but in six years we’ve only heard a couple of reports of theft. The highest risk of theft is almost certainly from unscrupulous other travellers. You’re unlikely to have a problem in a private bungalow of your own where local people are always around, but if staying in an isolated homestay you might be more comfortable keeping your cash and valuables with you. Bedding: Most homestays don’t have “real” beds – just mattresses on the floor or on a fixed platform raised above the floor. Mattresses are usually equipped with a sheet, pillows and bolsters. Mosquito nets in good condition are almost always provided, but you might want to have a needle and thread with you in case mending is required. Some homestays have rooms with mattresses on freestanding wooden bases, but you won’t find any with hotel style mattress and base ensembles. There’s quite a lot of variation in how rooms are furnished. Some homestays have floorcoverings, mirrors, shelves and bedside lamps and fans. Individual homestay page descriptions and photo galleries will show the details. With the exception of homestays with VIP bungalows, toilet and bathroom facilities are in separate buildings which are shared by all guests. Some huts combine bathroom and toilet, some have them in separate rooms. Floors in bathroom buildings may be sand, timber, crushed limestone or (less commonly) concrete. As mentioned above, several homestays now provide ensuite private bathrooms. You can quickly find those by using the accommodation page search filters. Individual homestay page photo galleries illustrate the available facilities. Bathrooms: Bathing is almost always by bucket and ladle, using fresh water drawn from a large container. This style of bathroom is referred to in the accommodation detail pages as a “dip mandi” or “bucket bathing” bathroom. Many homestays have piped water to replenish the large container. Waste water from most bathrooms is not plumbed, but channelled away to seep into the ground, so try to stick to environmentally safe biodegradeable soaps and shampoos. Very few homestays have real showers, but they are becoming more common. A note about bathing water: Most homestays are on islands that have fresh groundwater, but on some of the smaller islands (Kri for example), the groundwater is brackish due to proximity to the ocean. If you can’t bear the thought of bathing in slightly salty water, avoid these islands. Toilets: Homestay toilets will be either western pedestal or squat style and are flushed by hand, using a bucket and ladle as in the bathroom. Toilets are connected to septic tank systems in all the homestays we’ve visited. Toilet paper is usually provided, but it’s a good idea to have some with you in case supplies are low and you can’t cope without it. Most homestays have communal dining facilities that also provide free drinking water, flasks or urns of hot water and tea and coffee making supplies. Dining rooms are usually roofed areas or huts with bench seats and tables. Some new homestays serve guest meals on bungalow verandahs until they are able to build dining shelters. All homestays have flasks or urns of hot water and free tea and coffee making supplies available around the clock in the dining shelter. Drinking water is also always freely available. Note that lack of a permanent electricity supply means that very few homestays have refrigerators. See this Raja Ampat homestay food and drink article for details of what to expect regarding meals and drinks. All Raja Ampat homestays supply electricity for lighting and charging devices, but they do so from their own generators. Because of fuel prices in Raja Ampat, this means that most can only afford to operate the genset from sunset until around midnight. Bring LED light sources with you if you want room lighting outside that period. A few homestays supply electricity all night, but almost none have it available around the clock. Some homestays have supplementary solar power supplies that allow room lighting after the genset is switched off. Power points for charging devices may not be present in your room, but will be available elsewhere if not. Internet access is only available at homestays that receive a good mobile phone signal. Very few homestays provide WiFi access to this service. See this Raja Ampat electricity, telephone and internet information for details about standard electricity voltages and plug types and internet access in the islands. Phone signal and data connection availability is described on each homestay’s page. No homestays have laundries and there’s only one we know of that has a washing machine available. You should be prepared to wash your own clothes by hand, although many homestays will perform the service for you for a small fee. As with bathrooms, laundry water is usually disposed of by ground runoff, so if you’re doing your own, be sure to use biodegradeable laundry detergents. Your Papuan hosts will almost certainly have had no hospitality training or experience of the expectations of tourists to more developed destinations, so you shouldn’t expect service like you might receive in a guesthouse or hotel in Bali or Thailand. Additionally, many homestay owners have very little English – although there’s almost always somebody around with enough to enable communication. If you don’t speak any Bahasa Indonesia, bringing a phrasebook or translation app will definitely help. Your hosts will want you to have a great holiday and all are able to organise guides, boat hire, transfers and excursions, but they won’t be available around the clock to cater to your every need. You’ll need to be fairly independent, especially when it comes to maintaining supplies of things like toiletries and any other consumeables you’ll need. It’s best to bring all those with you, as shops out in the islands are few and far between and only stock a limited range of basic supplies. Sundays are a day of rest and church and community activities for your host families. There are no organised activities available on Sundays. If you are at all culturally sensitive, you’ll resist the temptation to pressure your hosts to take you anywhere on Sundays. All homestays provide Waisai transfers for arriving and departing guests on Sundays, but if you want to be especially considerate, avoid scheduling arrivals and departures on Sundays if possible. Everybody deserves a day off! 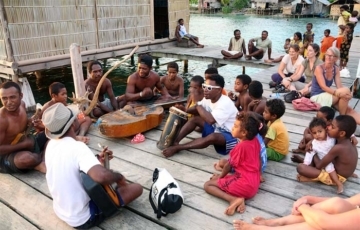 Read this Raja Ampat local culture article for more information to help ensure you have the best time at Raja Ampat homestays. If you decide Raja Ampat homestays are for you, our step by step guide provides a quick trip planning checklist and the answers to the questions most visitors ask. Amazing website – you guys do a fantastic job. We are off to stay at at Corepen Homestay on 25th and have realised I’m unsure how we pay! Is it cash only? Many thanks in advance if you get this message in time! Payment at most homestays is cash only, yes. If Corepen has the ability to process credit card payments, they haven’t told us so. The features list on each homestay’s page will say if credit card payments are available. You need to be aware of this before relying on cards though. All the best for your stay! I address here all the homestay of Raja Ampat. Why did you try to please us for most of the mattresses on the ground? I think it’s not difficult to find wood in your forest and make single beds but raised.On is not abituées to sleep on the ground especially with insects that walk in the forest.And to the price you say that they are twice the same as the rest of Indonesia (including for example the mollusks as difficult to access as you) for a much less comfort (no toilet in the rooms) we deserve good here. In addition mattresses last longer because they take moisture. I think it is by habit and tradition that you offer us here, so my message to the purpose only to inform you that we, the tourists, we not at all this use even if obbige well, we adapt. This information is given just for constructive purposes without being polemical. Saya alamat di sini semua homestay Raja Ampat. Mengapa Anda mencoba untuk menyenangkan kami untuk sebagian besar kasur di tanah? Saya pikir tidak sulit untuk menemukan kayu di hutan Anda dan membuat satu tempat tidur tetapi dibesarkan.Pada tidak sopan untuk tidur di tanah terutama dengan serangga yang berjalan di hutan. Dan harga yang Anda katakan bahwa mereka dua kali lebih sama dengan daerah lain di Indonesia (termasuk misalnya moluska sulit diakses seperti Anda) untuk kenyamanan yang jauh lebih sedikit (tidak ada toilet di kamar) kami layak di sini. Selain itu kasur tahan lebih lama karena mereka mengambil kelembaban. Saya pikir itu adalah kebiasaan dan tradisi yang Anda tawarkan kepada kami di sini, jadi pesan saya untuk tujuan hanya untuk memberi tahu Anda bahwa kami, para turis, kami sama sekali tidak menggunakan ini meskipun obbige baik, kami beradaptasi. Informasi ini diberikan hanya untuk tujuan konstruktif tanpa polemik. can I get beer cold bring a cooler if there is ice available ?? As it says above Colin: Homestays are not licenced to sell alcohol and only a few of the most popular places have refrigerators. First of all, let me thank you for providing very helpful informations regarding Raja Ampat. 1. We are planning to visit Raja Ampat in a rather large group (a total of 12 people). For transportation purposes, would there be any particular considerations that we need to be aware of since it is a large group? Like, for instance can long boats or ferry accomodate all 12 of us, or would there be different costs or different types of boat to consider? Would you suggest us arrange a special tour for our group – as it may not be as easy as small group? Do you have any tour provider to suggest? I have contacted Christian Sauyai, and still waiting for his response. 2. Also since we are going in a large group – I am wondering how we should make bookings for homestay, as the availabilities are not immediately confirmed and i am not sure whether we should instead try booking two or three homestay just in case. On average, how long would we need wait for confirmation of our booking. 3. Would you have any suggestion on which islands would be more suitable for us, coming in a big group? Thank you so much, again, for this website. 1. There are only a few homestays with boats large enough to carry 12 people at once. Most homestays would use two boats to transport you (which doubles the cost of course). Hopefully Christian will reply soon and will be able to accommodate you, but if not, I would suggest joining our Raja Ampat Travellers’ facebook group and contacting member Peter Makusi who is also a tour organiser. 2. If you all want to stay at the same homestay and you are sure of the dates you want, then submit a booking request for the number of rooms/bungalows that you need. As explained here, most homestays respond quickly (within an hour or two). You will never have to wait longer than 48 hours for confirmation of a request. Because you are requesting a booking when you submit the form, you cannot request the same dates from different homestays. 3. Arborek may be the island that will suit you best. It is quite central to everything and has lots of accommodation. Hello! Do you have informations about accomodation rates for children at the homestays? Do children have to pay the full price(full board), can a small family with an 8 year old child, for example, stay in a bungalow that sleeps a max. of 2 persons…? Couples with a single child can certainly share the same bungalow, as most homestays can organise an extra mattress when required. Homestays may offer discounts for young children. A few have published those on their website pages, but at most places you would need to negotiate. Firts I would like to say your page is really great with all info regarding Raja Ampat. Don’t know that one Jernej. what are crime rates like? I am in Sumatra and methamphetamine-driven crime is high, but we have bars on windows & safe so reasonably safe, but it seems would have to carry good quantity of cash plus normal stuff like camera, laptop (not excessively expensive, but let’s say $1000). That kind of crime in the islands is non-existent as far as we know. We believe that it’s true to say that it’s very safe indeed once out in the islands. Waisai and especially Sorong would present a higher level of risk. The few thefts of personal possessions reported to us so far were all from the busiest of the Kri homestays and were quite likely committed by unscrupulous other guests rather than homestay staff. We have been visiting regularly for over 7 years now and often leave valuables in unlocked rooms, and even more frequently in bags in boats while snorkelling. We’ve never experienced a problem. 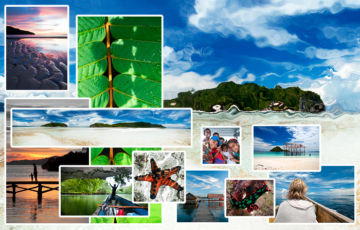 This website has been incredibly helpful for our family as we planned our trip to Raja Ampat. We leave later this month. I see that bedding and mosquito nets are provided by the homestay. There is no mention of towels. Is it safe to assume we should bring our own bath and/or beach towels? Many, but not all, homestays supply towels. You know how it goes: If you take them, you’ll probably not need them. If you don’t, you may well wish you had! We usually pack sarongs in case we find ourselves at a place that doesn’t have towels. They’re multi-purpose, dry quickly and take up less room than regular towels. Had been to 7 homestays so far and all provided towels. If they don’t, just ask. If you book through Stay Raja Ampat site, you normally get an email asking to confirm your booking a little before the intended stay. But what if you have no signal (as is often the case if you are already in Raja Ampat area) and can’t confirm your booking? Is it going to get cancelled? PLEASE PUT THE MAP BACK!!! Thanks for your vote though. We hope that Google Maps and this map (which also shows most of the homestays) will do until #RETURN THE MAP!! becomes an overwhelming movement. Oh, yes, please put the map back. The is a fabulous website. What is late February like for coming out to do home stays? We are most interested in quality snorkeling and supporting families who truly care about reef conservation. February’s good. Use the “Good house reef” search filter on the accommodation page to quickly find the places with excellent snorkelling at the door. We are a couple from Portugal, and would like to accomodate in a homestay. Your country is beautiful. What is necessary to have for a tourist entry permit/Visa to enter the country? Only a return ticket? Is all done in Sorong Airport? Its that simple? Are there any boat transfers for all homestays from Sorong, or we always need to go to Waisai to take a boat? Are there excursions for diving with whalesharks in Cenderawasih bay from the Waisai zone or do we need to take some days do go to Manokwari zone? Are there homestays in Cenderawasih Bay? Citizens of Portugal can enter Indonesia on a free visa for 30 days. If you want to stay longer you’ll need to get a 30 day visa on arrival and extend it, or else get a 60 day visa before you leave Portugal. Whether you need a ticket out of Indonesia will depend on which airline you are flying in on. Sorong is not an international airport, so you’ll need to enter the country somewhere else and then fly to Sorong. Some homestays offer Sorong pickups, but it is much cheaper and more comfortable to take the ferry to Waisai and be picked up from there. You can’t visit Cenderawasih Bay from Waisai. We believe there are homestays in the bay now, but we don’t know anything about them. See our trip planning guide for all the information you need to know. I love the new website but miss the map with all the different accommodations. Now you have to check each one separate and it’s difficult to spot new homestays. If enough people ask for it, we’ll have to reinstate the map! All the homestays are on Google Maps though, which means that you can make any map on the site fullscreen, then zoom in and pan around to see all the homestays. Additionally, each island guide has links to all the homestays in that particular location. We’re all about user experience though, so will definitely add the map back if we get enough requests to do so. What is the Easter weekend like in the homestays ? Does it completely shut-down between Friday and Monday with no diving or homestay transfers ? I tried to find an answer to this at the site, but since I couldn’t I try here. How long time ahead do you recommend booking? I plan to go in March. I understand that the answer is depending to each homestay, but some general idea would be good. Are the homestays often fully booked? Thanks for a great site, and you seem to do an awesome job! If you want to stay at one of the more popular homestays, then we recommend booking at least a month in advance for a March visit. The popular homestays are indeed often fully booked, but there are always alternatives available. – I plan to spend 2 weeks there (end of december), is there any homestays that could give a-half-month rate? – is it safe to stay in homestays in raja ampat and travel alone (female, indonesian)? – Solo female travellers haven’t reported any issues in Raja Ampat that we’re aware of, so yes – it should be perfectly safe. – Use the website advanced search to select the things that are important to you and quickly find a list of matching homestays. 3 meals a day are included in all homestay prices. Is Saturday or Sunday the day of rest on Kri? On stayrajaampat.com it says Sunday, but on most other diving site as well as Kayak4Conservation, it says Saturday (typically 6pm Friday to 6pm Saturday). It’s Sunday at all the homestays and (with 2 exceptions) at all the local villages Greg. K4C and the associated resorts there are owned by a Seventh Day Adventist, so for them it’s Saturday. No shortage of colourful coral in Raja Ampat edward! Use the advanced search on the accommodation page to quckly find places having the features “coral” and “good house reef”. The Yenbuba jetty and its surrounds are a great place to start. These homestays are the closest to Yenbuba. Two Kayak people heading for Raja Ampat, late December 2017. Is there som Homestay you can recommend, doing Kayaking…? If you want real oceangoing kayaks, Kayak4Conservation is currently your only option. Some homestays like Piaynemo do have sit on tops available for short paddles around the homestay. FYI: This and a lot of other questions are answered on the pages linked from our step by step guide. which “diving license” do we need to practice diving in Raja Ampat ? does a “first dive” certification is enough to access to some nice areas ? You need a minimum of Open Water dive certification to dive safely in Raja Ampat. See this info. Hi, can you recommend the best homestays that could accommodate 12 pax, 4 days 3 nights and possible for fishing, snorkeling and other interesting activities. Sorry to take so long to respond: We’ve just returned from 12 days without internet access in Raja Ampat. If you want all your group at a single homestay, use the Advanced search function and select the “Large groups OK” feature. An alternative would be to split your group between neighbouring Kri homestays. We stayed 3 nights in both, Yenros – we had room over the sea with sea breeze. Thoroughly enjoyed the added bonus of sitting on the veranda to watching the tide come in and out – saw so much just looking into the crystal clear water. Snorkelling from beach was easy and fascinating. Walking trip to see Wilson’s bird of paradise for dawn an incredible sight. We journeyed from here by ~20 min boat to Yenkangkanes Home stay. Lovely family with a delightful 4 year old, beautiful beach and again great easy snorkelling. My only 2 word of advices for snorkiling are: a rash shirt or equivalent is essential for protection from the sun and watch out if you are out snorkelling and it is near low tide you will need to find the channel the boat comes in to find your way back for safe clearance from the corals. You do need to bring your own snorkle gear the first place had flippers not sure about the second. Could you tell me, can we use us dollars to pay for our stay and if not, where is better to exchange money? You need to pay in IDR. See our Money, Banks and ATMs page for more. We wont s 18.10 – 22.10 octovbe. 2 person.snorking.senkye. You need to choose a homestay from the accommodation page. Here is how to make a booking when you have chosen. I contacted by SMS to homestay to book room for particular dates. They wrote me, it is OK to come in those dates. Can I be sure, that we will have space when we come? As long as the homestay you booked with doesn’t have a lot of comments about problems with room availability and as long as you made it clear to them that you wanted to reserve a room for those then yes – there should be a room for you. I’m planning to visit Raja Ampat with my children, from July 14- 19, and we would like to do some snorkeling and sightseeing, and I’m planning to do homestay. Can you recommend me where should we go for that short time ?. THe homestays on Gam provide a nice central location for sightseeing and village visits, or the ones on Kri if you want to be around more fellow travellers. Or you could do a few nights at each! That’s a good idea Amei, but we might have to wait until visitors are a bit more evenly spread among homestays, otherwise it’s hard to see how it could be won by anybody except the most visited homestay! Hello , i like to visit raja ampat at the end of october i only dont know wich date is it ok to make a last minute booking. And i only can stay for 4 days . I like to make some dives. What can you reccomand me for so a short time. If you want to dive during a stay of 4 days you’ll need to book at one of the homestays linked from our diving article. Hi Arianna – sorry to take so long to approve your comment – it was trapped by our spam filter! Weather in August is variable as it is a transition time from the windy season. It’s usually calm again by the middle of the month. The north shores of islands are the best protected during the windy season. We are two families, 6 people in all. Since we are not after a diving holiday there, is it possible to make a home-stay at Raja Ampat and the locals take us for boat rides around the islands? We were informed that there are only liveaboard diving tours around the islands. We really wish to have the experience of seeing the wonderful islands while we are on a month holiday in Indenesia.! Yes it is Maria. All homestays can arrange boat trips for snorkelling and sight-seeing. We are planning to go to rajat mpat. Is yenkoranu homestay still the only homestay with ensuite bathroom? Hi Charlotte – Yenaduak Family Homestay on Birie Island near Batanta also has a bungalow with ensuite bathroom. Yenaduak and Yenkoranu are the only two we know of at present. Hi!! We are traveling to Raja ampat the FIRST week of november 2014. I sent an email to yenkoranu homestay but didnt get any answer. Can any one tell me a good homestay to spend some days? We are 2person Who want to do some snorkeling, walkings, try diving also and do an excursion to Wayag. Wich homestay do you recomend us??? Thanks a lot!!!! Hi Natalia – Don’t know how long it’s been since you emailed, but you need to give it a few days. SMS phone message is often the best way to make contact – see more about making contact on this page. If you have no luck at Yenkoranu, try using the show advanced search feature on the accommodation page to quickly find homestays offering what you want, then check out the feedback section at the bottom of each homestay page to see what other guests have said. If Wayag’s on your must-do list there’s also the option of locally operated liveaboard boat tours. Just fantastic information! We have been to Raja Ampat twice and are going in January–this time to try out the home stays. There are so many good ones to choose from. We really appreciate all this information. Is there anyone we can write about our desires and get some help with choosing which ones to visit? We are snorkelers, would like good coral and would like access to a village for the culture. Thanks again for putting all this information together. It’s very helpful! Thanks Ann! :) If you have questions you can’t find the answers to by using the site search, by all means ask us via our contact page. The easiest way to narrow down your choices on the accommodation page is to click the Show advanced search link, check all the boxes that apply to the features you’d like, then hit the blue Search accommodation button. If you want to be within walking distance of a village and have great coral, Arborek, Friwen, Sawinggrai and Yenbeser all fit the bill.